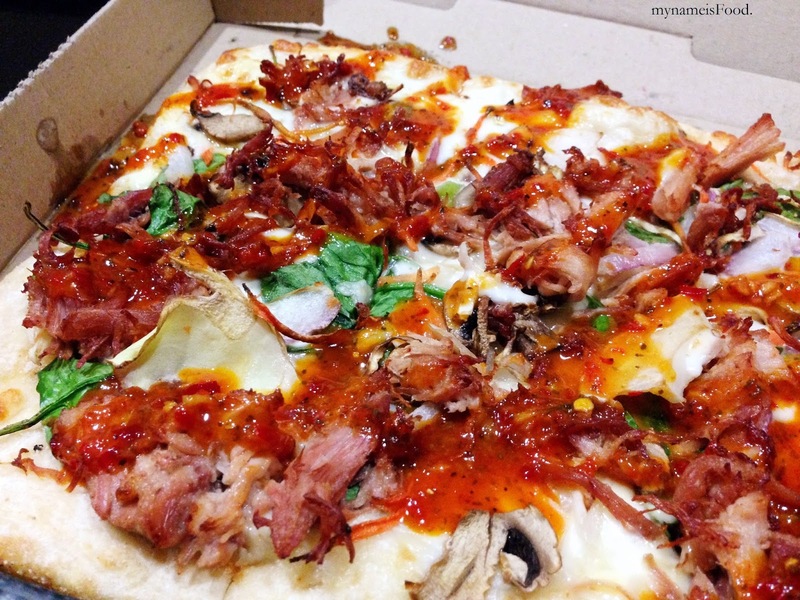 Domino's Pulled Pork Range Review - my name is Food. 'Pulled Pork Meatlovers' ($11.95) consisted of Italian sausage, pepperoni, rasher bacon and pulled pork with mozarella and BBQ sauce. I did find the pizza to be somewhat messy when we opened the box. The Pulled pork meatlovers was just like your typical meatlovers (without the ground beef as pulled pork replaced it) so it wasn't anything special in regards to toppings nor taste. The smell and flavour seemed appetizing however the pulled pork seemed to have been overpowered by the other meats on the pizza. 'Hickory BBQ Pulled Pork' ($11.95) consisted of tender pulled pork, red onion, capsicum, mozarella and a swirl of Hickory BBQ sauce. 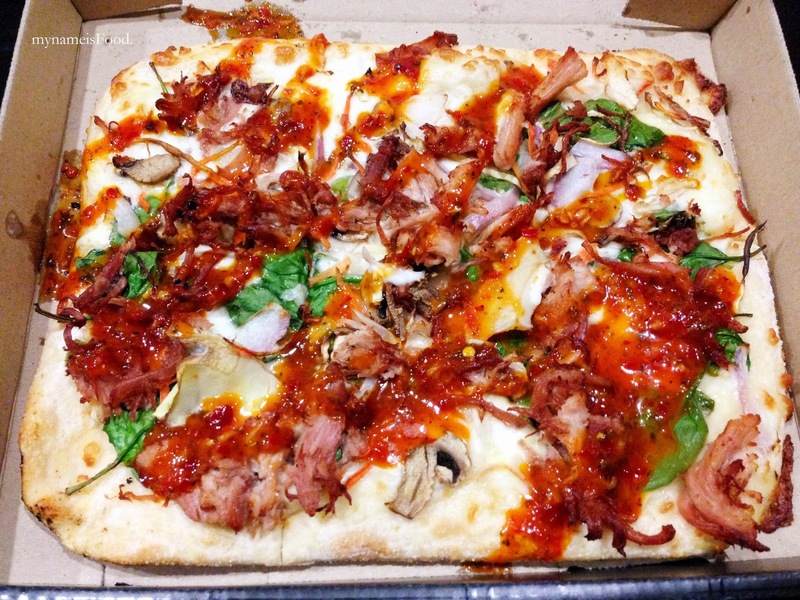 I found this to be much simpler than the meatlovers and since the pulled pork was the only meat on the pizza, you could really taste the tenderness of the meat and again, the toppings weren't consistent on each of the slices. More capsicum slices would have been nice since they were cut into tiny little pieces and scattered around the pizza. Having that vege bits makes the pizza a tad healthier-looking. 'Chilli Lime Pulled Pork' ($11.95) is something you don't commonly see in menus and which I found to be the favourite out of the three in terms of trying something different than their usual typical pizzas. It had tender pulled pork, crunchy Vietnamese slaw, mushrooms, baby spinach, red onion, mozarella, creme fraiche and a drizzle of chilli lime. I found that the chilli lime combined with the tender pulled pork was somewhat unique in both taste from what you would typically get. I am not sure if they are a match-in-heaven as I would probably have preferred to leave the pulled pork by itself, enjoying its smokiness and all.. The Vietnamese slaw? I'm not sure if that's what they should've called it since I didn't really feel like it tasted like a Viet slaw. I'm not too sure what was in it either, maybe lettuce and shredded carrots.. The creme fraiche was a nice touch for the base and made the chilli lime creamier as you take every bite of the pizza slice. 'Belgian Hot Chocolate Fudge Brownies' ($4.95 for 6 slices) was a nice way to end the night after gobbling down the pizzas. No, we didn't end up finishing all of the pizza since it was only the two of us, but we did finish the fudge brownies. The fudge sauce was a nice condiment that came with it and I think enjoying it both warm or at room temperature is fine. I was surprised however as they were able to make the brownies quite settle on the outside and moist in the inside. * mynameisFood. was provided with all three pizzas of Domino's Pulled Pork range and Fudge Brownies by Dominos.